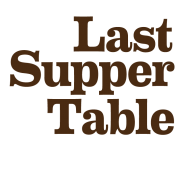 The generosity of the hardwood industry in Michigan resonates loudly in the Last Supper Table. Between Detroit and Grand Rapids, we discovered two hardwood apostles. The first apostle supported the lumber required for the Last Supper Table’s surface; the fifth apostle supported the lumber required for the sawhorses and seats. Like the first, Apostle No. 5 was introduced to us by Pike Lumber as well as Armstrong Millworks. And like the first, he is someone we have yet to meet but whose warmth and support are so palpable over the phone. Along with a contribution from Pike, Apostle No. 5 allowed us to secure thirteen 10’ boards of 4/4 walnut. Apostle No. 5, thank you. Opening Day and Round 1 Voting begin! "MARGARITA. Angel in life and in death." One year ago today, my vivacious but fading aunt made the trip from #toronto to #detroit and sat at our dinner table for #thanksgiving, before the #lastsuppertable was fully conceived. She passed away just a few months later. One of the first #markings on the table were dedicated to her.